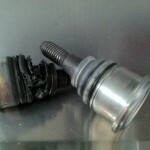 Preventative Maintenance – Don’t Put it Off ! At Das Autohaus, we believe that Preventative Maintenance is KEY. Whether it is something as simple as an oil change or something like suspension components, random squeaks or pesky engine noises, address your vehicle questions now in order to save money down the road. This week, we had a customer bring in their Ford Taurus. While changing the oil, our technician noticed that the inner tires were starting to wear. After further inspection, our technician discovered that the lower ball joints were worn out and that the tires were being damaged (uneven tire wear) as a result. If left unattended, our customer would soon be buying new tires….and we all know how much we don’t want to spend money if we don’t have to. This picture shows what a worn ball joint looks like – thankfully, the issue has been addressed, parts replaced and our customer is thrilled that we saved her tires (and money). Whether you are driving a VW Passat, Audi A4 or a Ford F150 pickup truck, it is important to “listen” to your vehicle. A little extra attention now will save you time, frustration and money in the long run. Bring it in to us at Das Autohaus and we’ll give your car or truck a proper “look over” and get you ready for Spring & Summer.